The 24-hour pool marathon has raised around £2,500 for a special campaign to provide first-aid training and kit to grass-roots football clubs. Dougie and Scott McEwan took on the challenge last weekend in aid of the Stephen Carey Fund. It has been set up in honour of the 21-year-old from Alnmouth who collapsed during a football match last year and subsequently died, despite efforts to resuscitate him. In tribute to Stephen, who was born with an unsuspected heart problem, and to try to prevent similar tragedies, a group of his friends formed the namesake fund to provide emergency first-aid training and equipment to football clubs. The aim is to start with the North Northumberland League, in which the talented midfielder played, with the future goal of including all leagues in the county, at both senior and junior levels. 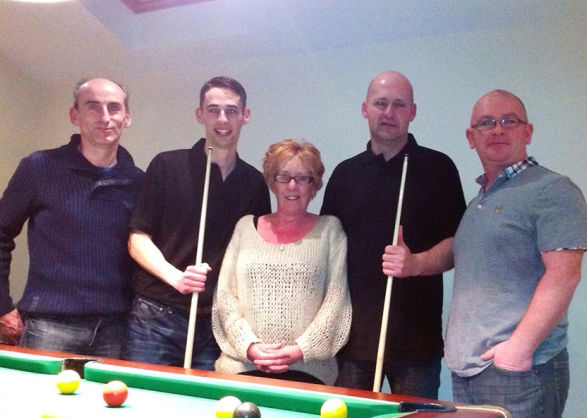 As part of the campaign, Dougie and Scott, who are on the fund committee, took to the pool table at the Farriers Arms, in Shilbottle, at 7pm on Saturday and played non-stop until the same time on Sunday, taking on numerous challengers along the way. Committee members Brian Shendon and Sean Henderson oversaw much of the event.